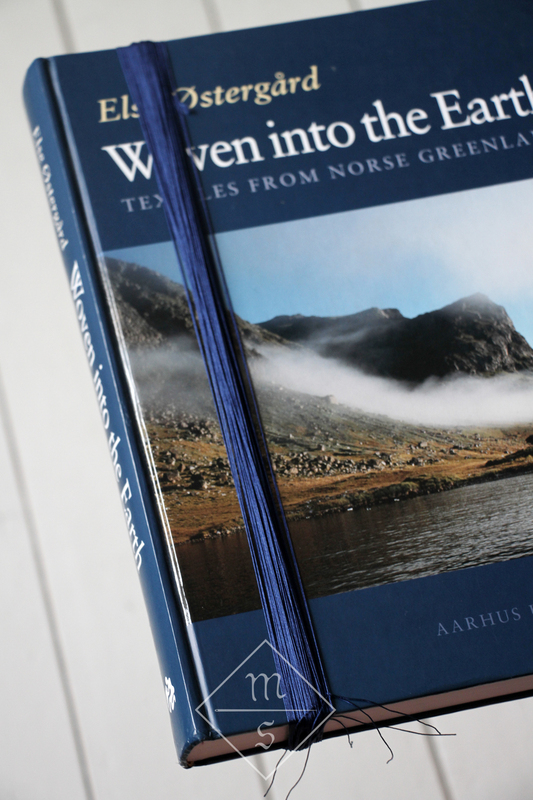 In today's post I want to talk about turk's head knots. 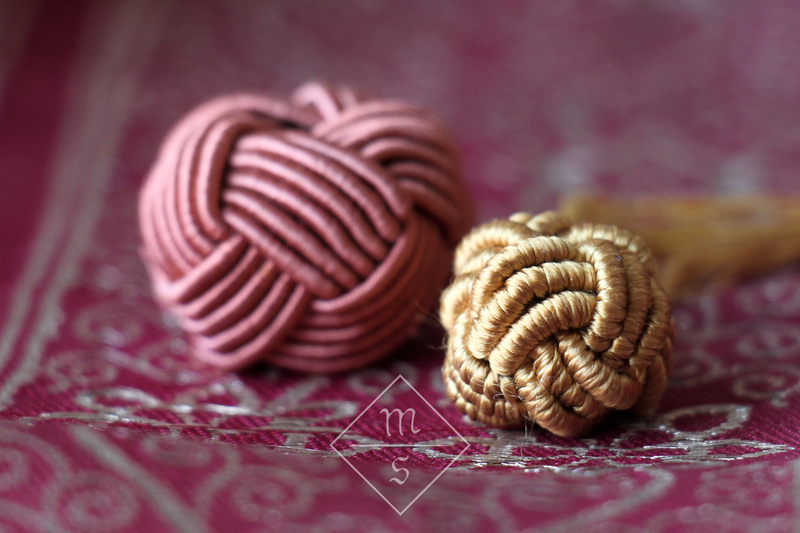 Turk's head knots are one of these things that make or break your Medieval purse reconstructions. 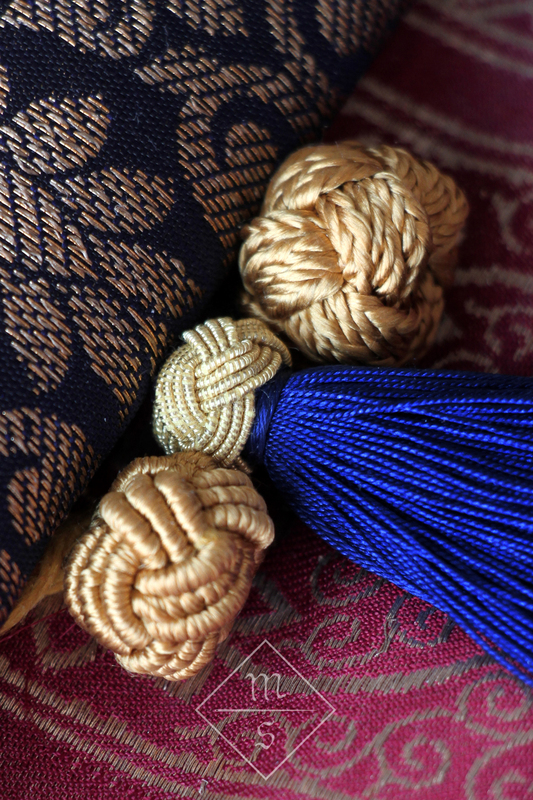 Tassel-heads were hardly ever left bare on extant pieces, and one of the most popular ways to cover them was with these knots. They were also used by themselves, i.e. 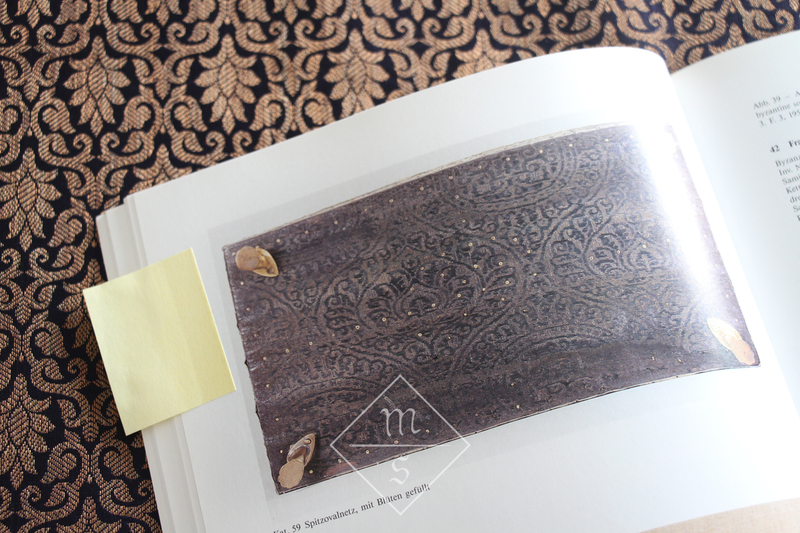 without a skirt or tassel, worked around a wooden, leather or parchment core. 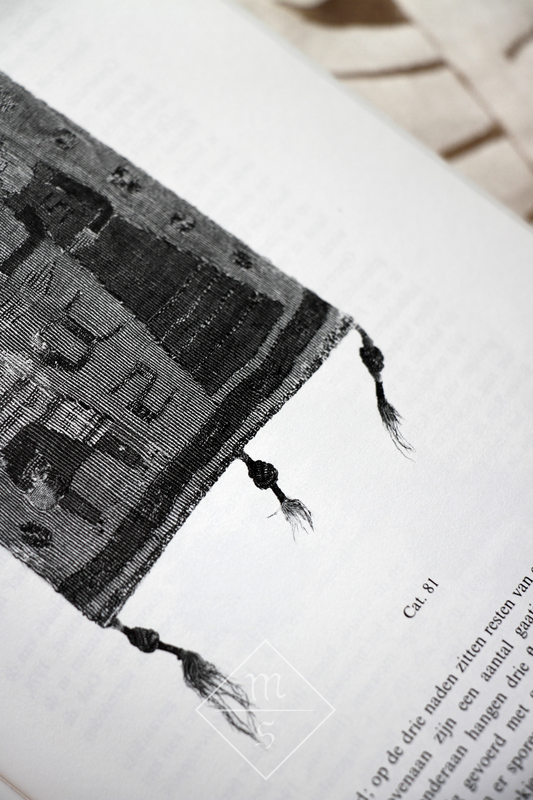 They embellished the corners or drawstrings of purses, pillows and cushions, or were even used as beads (see images below). 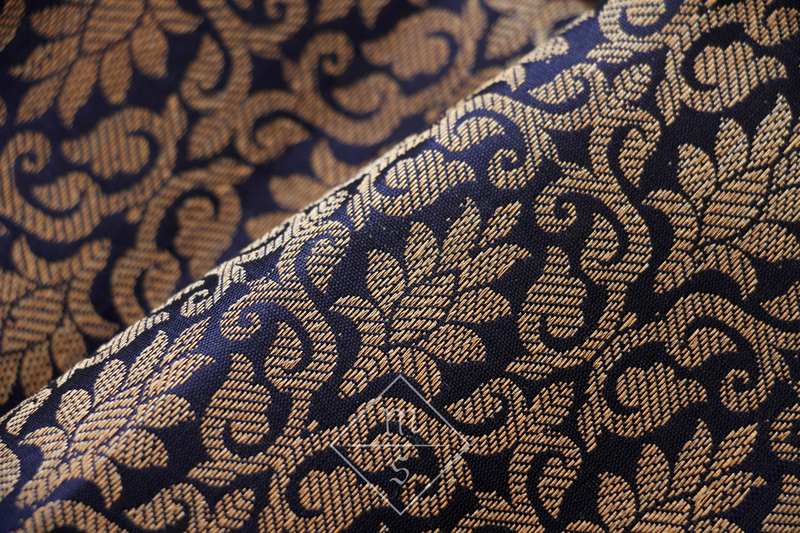 Turk head's knots were made from a number of different materials. 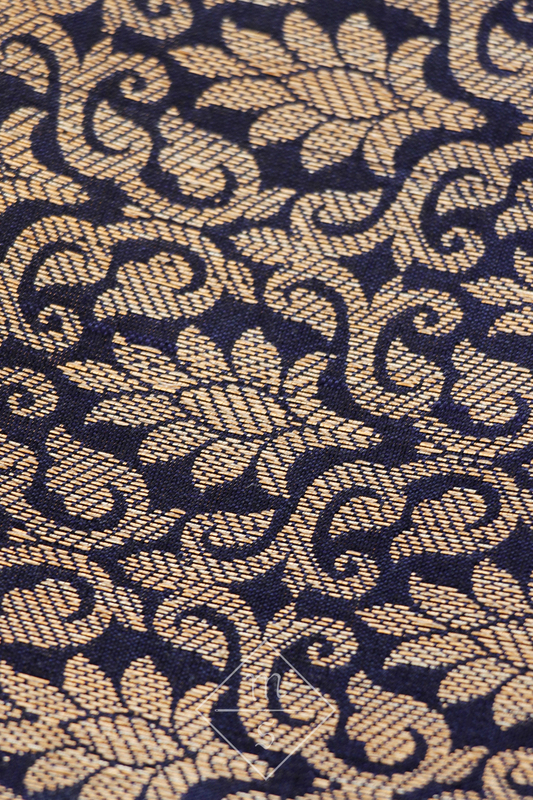 In the image above you can see from top to bottom: silk braid, gold gimp and silk gimp. Gimp is a type of cord made by wrapping a thread around a thicker core thread (or bundle of threads). 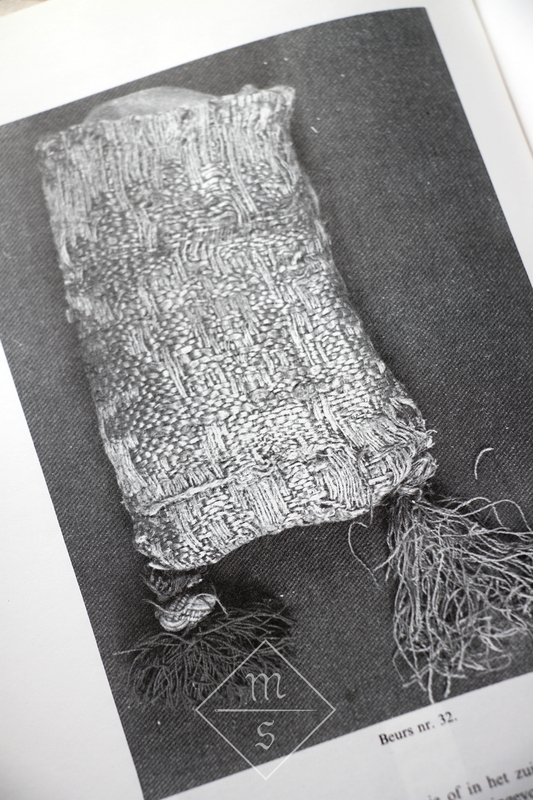 The cord or gimp the knots were made from, varied not only in material but also in thickness or diameter. The thickeness of the cord you'll be working with will influence the size and look of your knot. 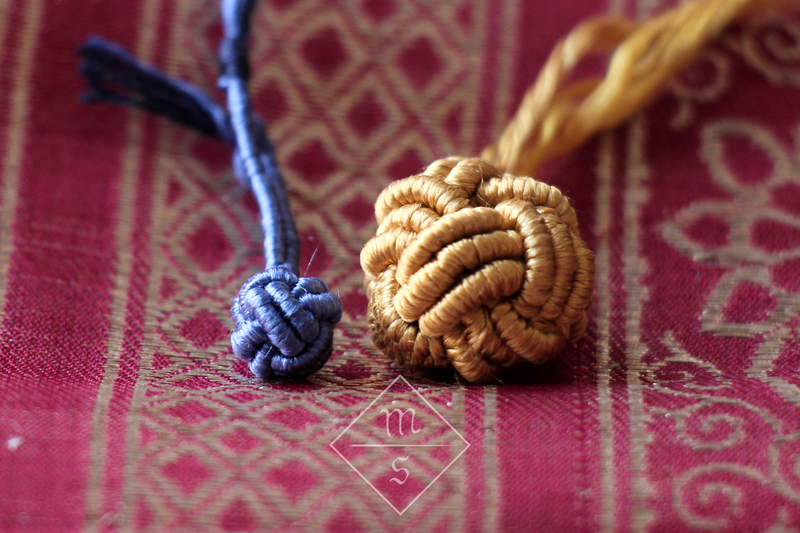 In the photograph above you can clearly see that the two silk knots are three-pass knots, while the one in the middle made from a thinner cord is a four-pass knot. The number of passes (i.e. how many times you go round when working the cord to make your knot). 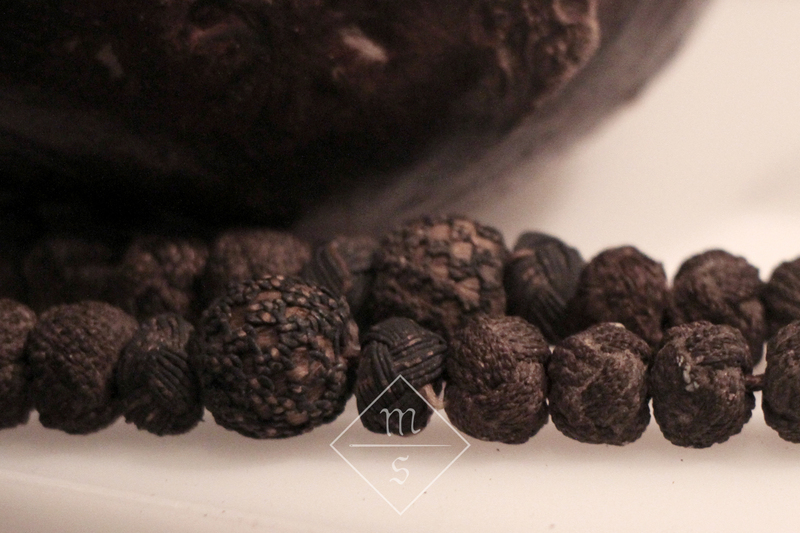 Medieval knots are often made from fine cord and can use up to seven or more passes. 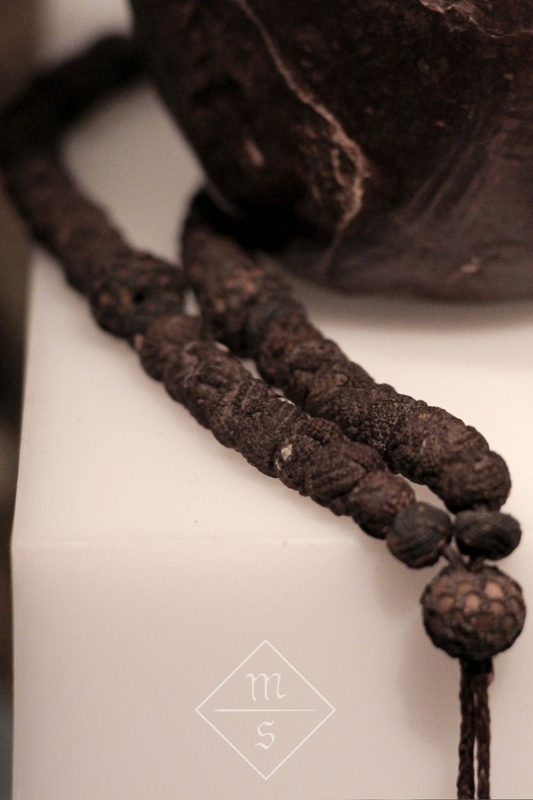 Although I have never seen turk's head knots made from braided cord on purses before, I did spot them on a c. 1500 rosary in the Museum of London earlier this year. In my attempt to recreate these knots in the first image, you can see that my fingerloop braid (a round 5-loop braid) in the first image is slightly less tight than the original rosary beads, but you get the idea. When I tied my first knots about 8 years ago, I also used fingerloop braids, even though back then I didn't know there were actually historical examples of this technique. Life is full of wonderful coincidences, isn't it? Silk gimp is what I have been using mostly for making my knots, even though it is not the most common option for purses. You can see two purses with silk gimp knots here and here. The pink knot above is a commercially made one, the yellow knot is made from - not so perfectly done - handmade silk gimp, and the blue monkey fist knot (a knot type that in some time will get a blogpost of its own) from much smoother handmade gimp. Silk gimp is very hard to come by. Most products on the market are viscose wrapped around a cotton core, and are of such poor quality that they will leave you behind in a very frustrated mood. Making it yourself is not very difficult, but it is a timme-consuming job. 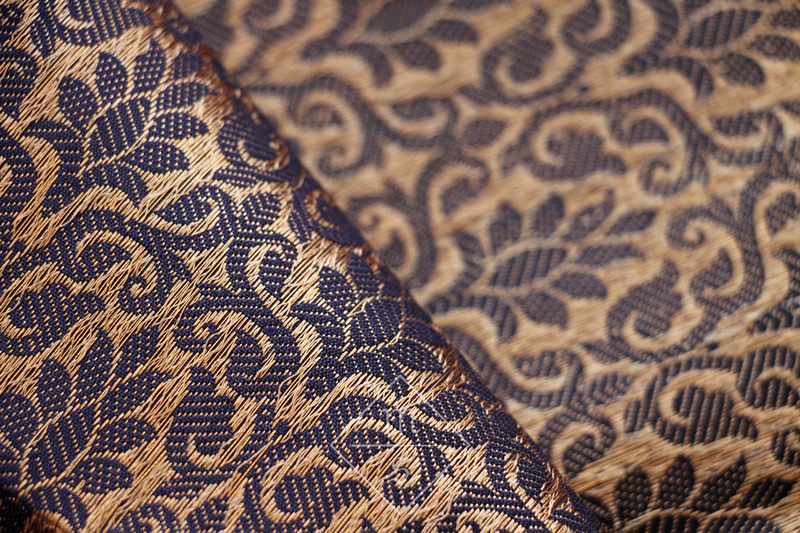 There is an old (well, almost ancient by now) tutorial on this blog for making silk gimp, but it needs urgent updating. 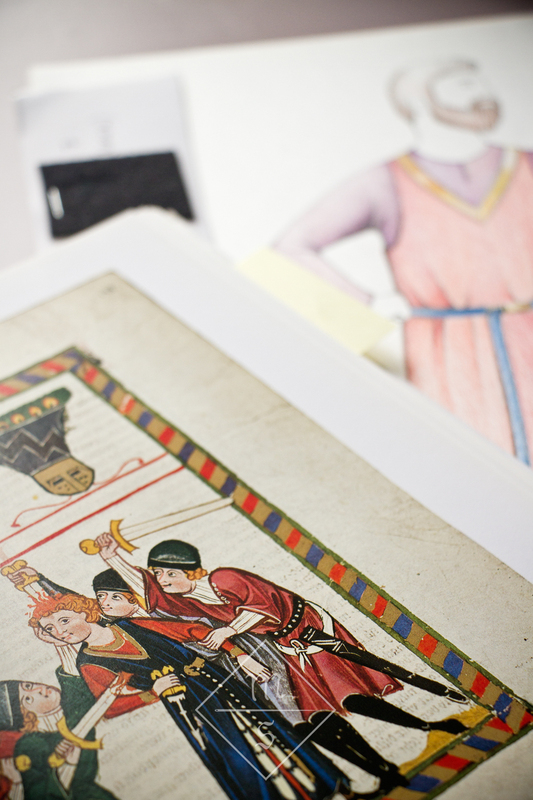 The most common materials for turk's head knots on extant pieces are metal thread gimp, or thick metal passing thread. The difference between the two is that metal gimp is made from a round metal thread wrapped around a linen or silk core, while passing thread is made from flattened metal thread wrapped around a core. The problem with metal thread gimp, is that it is more or less impossible to find. I had the spool below custom-made. Of course you could also try to make it yourself in much the same way as silk gimp. 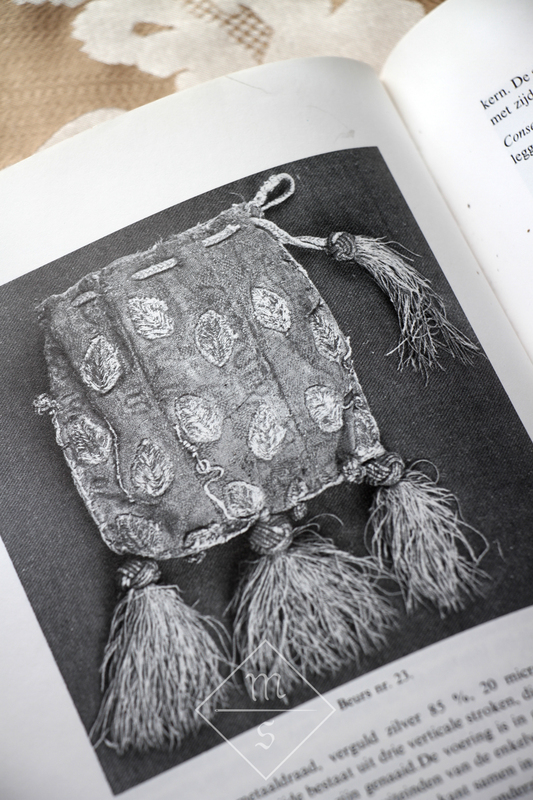 Knots made from passing thread can be easily recognized on extant purses because often the metal parts have been rubbed off almost completely, leaving only the core threads behind. This is the reason why I prefer gimp over passing thread. Passing thread does not only wear off more quickly, it also damages much more easily during the knot-making process, which is not very encouraging for a beginner knot-maker. My advice to any beginning knot-maker would be to start out with using braided cord. Making a five-loop fingerloop-braid is not too hard, and you'll need to learn this skill for making the drawstrings of your purse anyway. 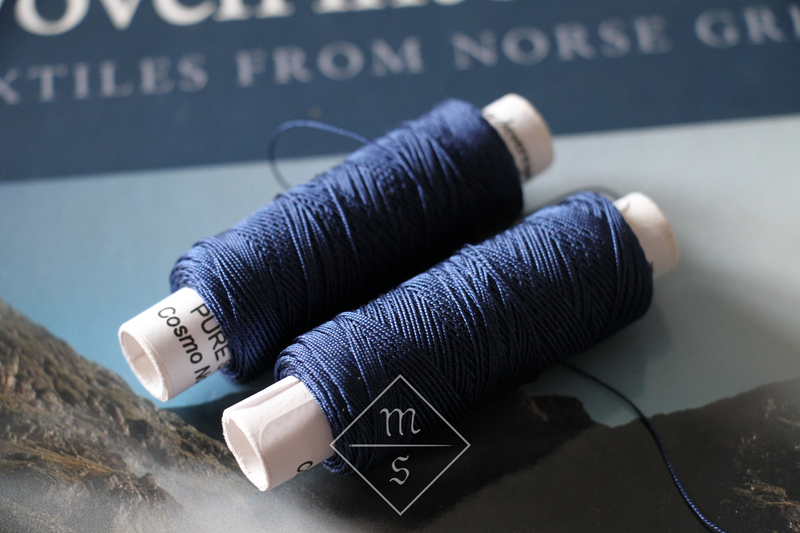 The silk needed for your braid is easily available from a number of suppliers (for instance Devere Yarns or naturally dyed silk from L'Atelier de Micky). It is the most forgiving material to tie knots with. 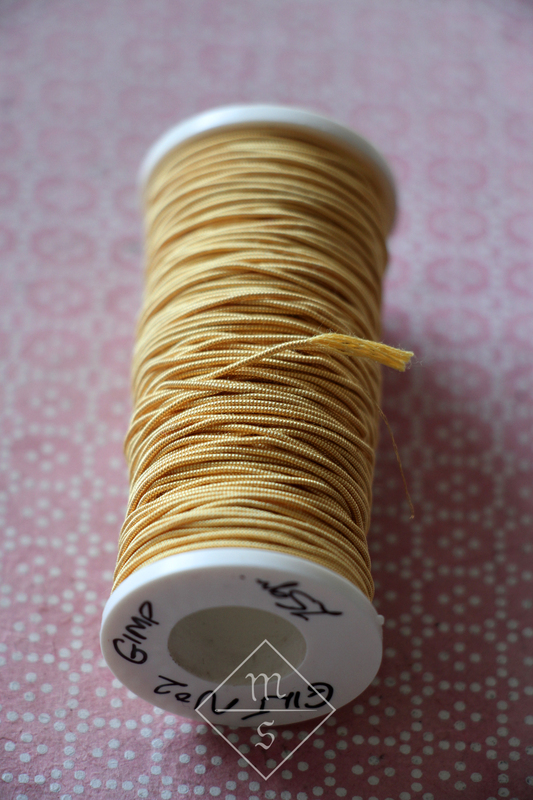 When you've had a few practice runs with braided cord, try making your own silk gimp. You should have gained enough confidence by now to know the whole knot-tying process by heart, so you can focus on the details and handle a slightly more advanced material. Stick to 3-pass knots to begin with. After this, you can start thinking about using metal gimp, and using thinner silk gimp, making more complicated four-, five- or six-pass knots. And finally, you should be able to manage knots made with passing-thread. I'm not yet at this stage myself. Hopefully one day. 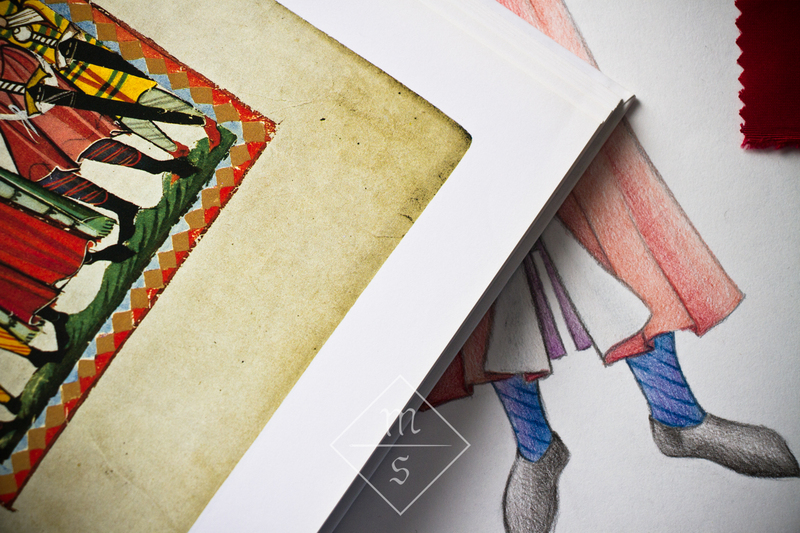 Recently I posted about the Floris V project, as I'm sure you remember. What was not in the design drawing was a nice purse for the Count. Well, of course I could not really let that happen, so I ordered some nice fabric. 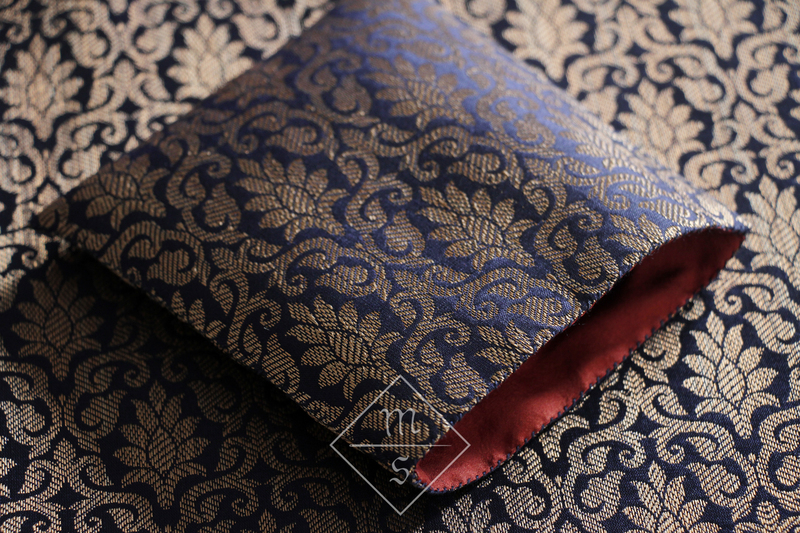 The fabric is Indian silk brocade (with imitation metal threads). 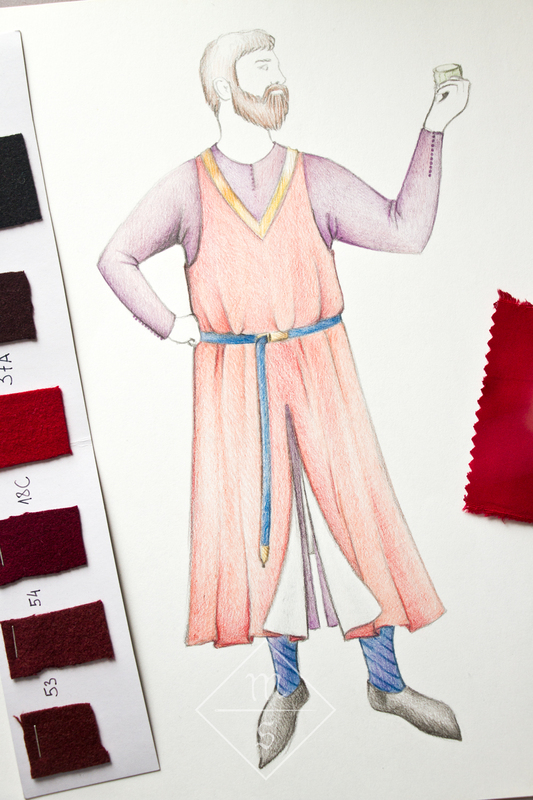 It is not a reconstruction of an actual Medieval fabric, but it resembles several extant silks from the 13th and 14th centuries. 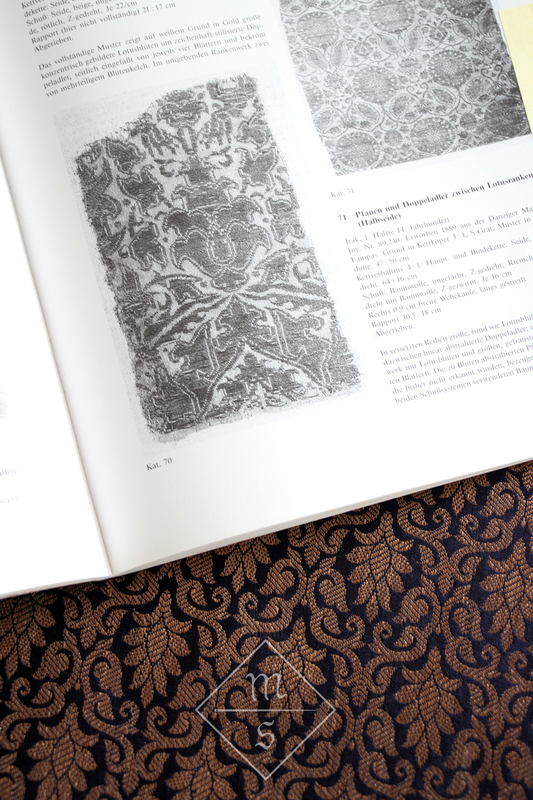 The lotus-flower was a quite popular textile motif. 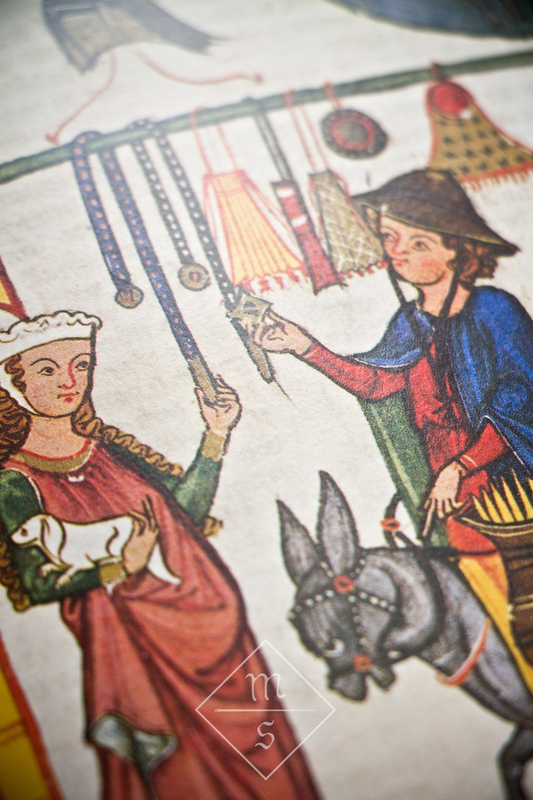 Although I would normally prefer a replica of an actual Medieval fabric, the tight budget, the purpose of the whole outfit (shows on horseback), and the medievalish pattern of the silk I felt justified in using it. The shape of this lotus flower comes pretty close to the one in my Indian fabric, although the overall pattern clearly differs quite a bit. If you mentally erase the dragon medallion from this example, we are getting a lot closer already. 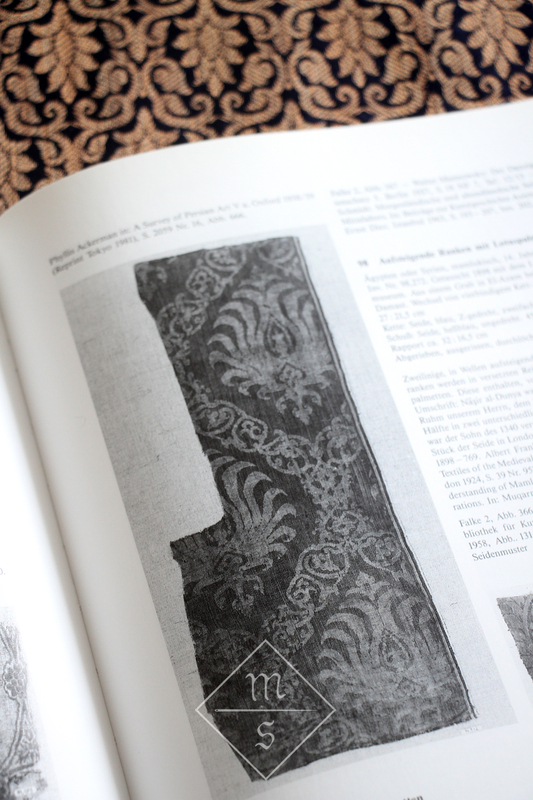 Although the pattern of the fragment above has a much larger rapport (which means that the pattern scale is bigger), the layout of the design elements is pretty similar to the fabric I bought. 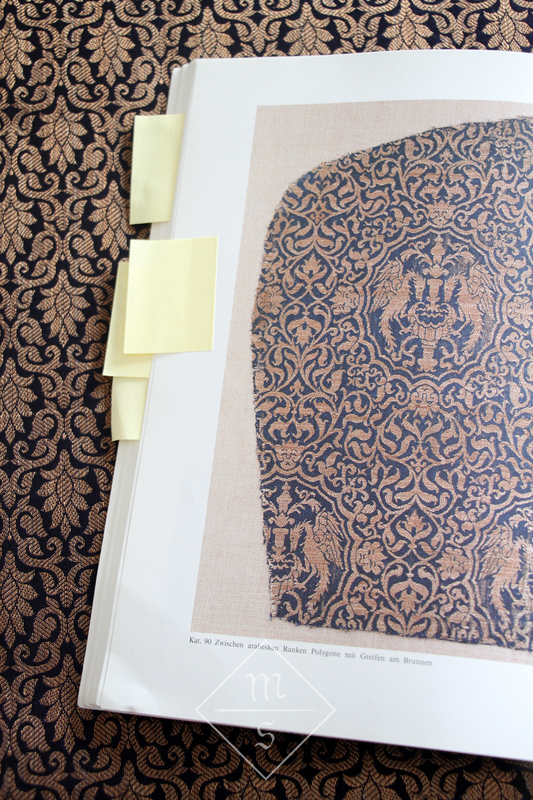 The one below also has the same pattern layout, and the size is quite similar to my piece of fabric. 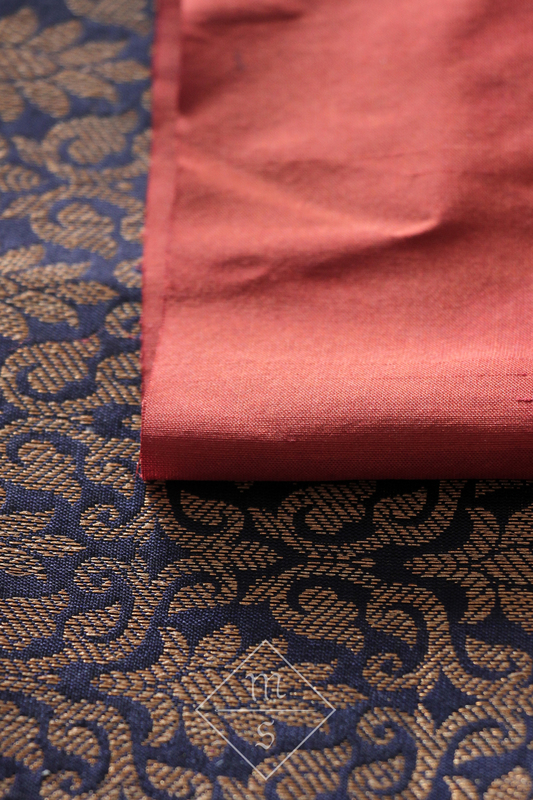 For the lining I used some brick-red shantung silk (similar to dupioni but with less irregularities, closer to most Medieval taffetas). I first like to line the purse, before sewing the sides closed. I sew the lining and outside fabric together with a running stitch so that the lining is slightly narrower than the right side fabric. Then turn inside-out. 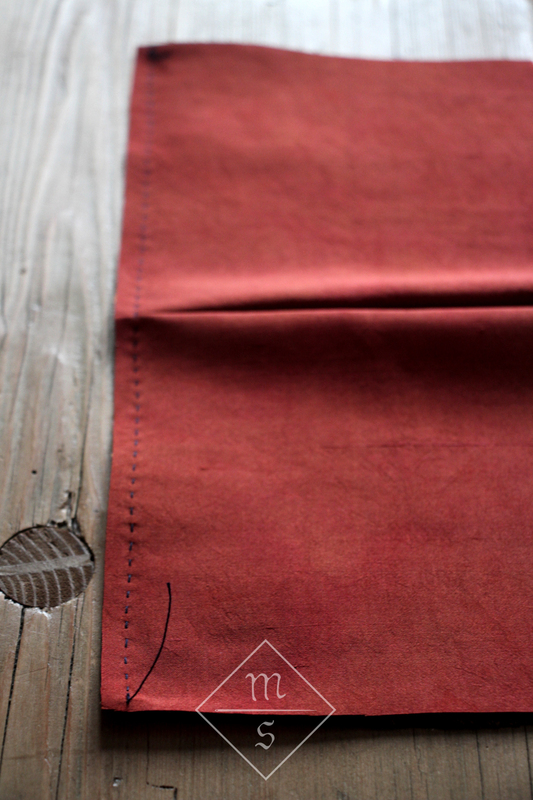 By making the lining a tad smaller, you avoid bulky side seams. 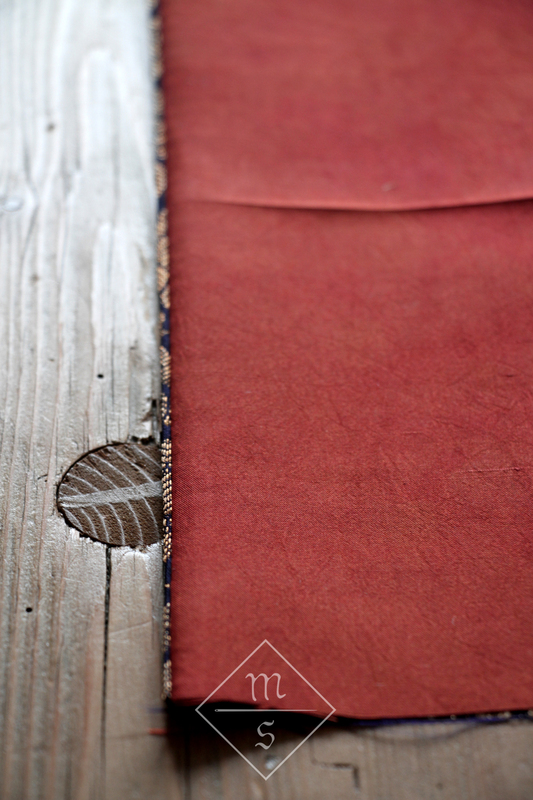 Fold in the raw edges at the short ends of the purse and pin closed. 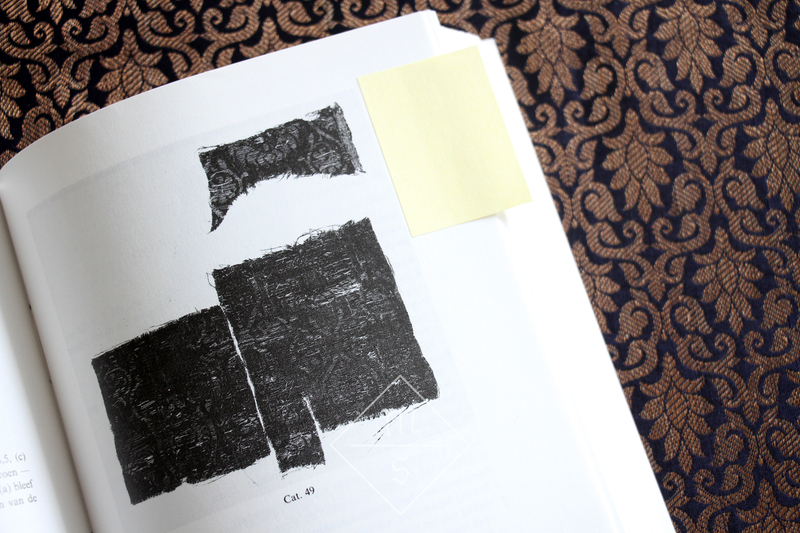 Fold your rectangle in half and whip-stitch the sides closed (sewing only through the outer layer and not the lining). In one go you can close up the short sides of the purse, around the opening. You've already seen the tassels that are meant to be going on this purse in the next construction phase btw. And if you haven't, click here. 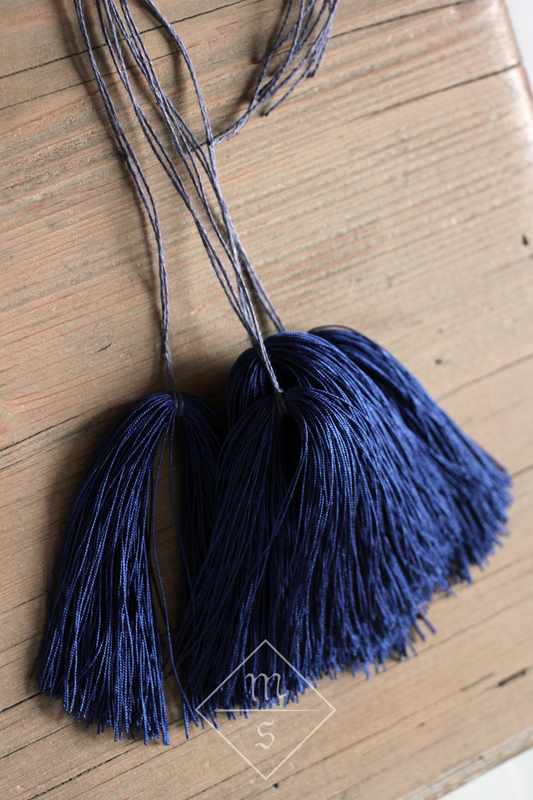 I have just realised that in all the years this blog exists, I have never done a tutorial on how to make basic tassels. Of course, making a basic tassle is quite easy to do and it's something you can figure out yourself or you can find tutorials elsewhere on the internet. However, I want to show you a little trick for quickly making multiple tassels of the same size and thread. 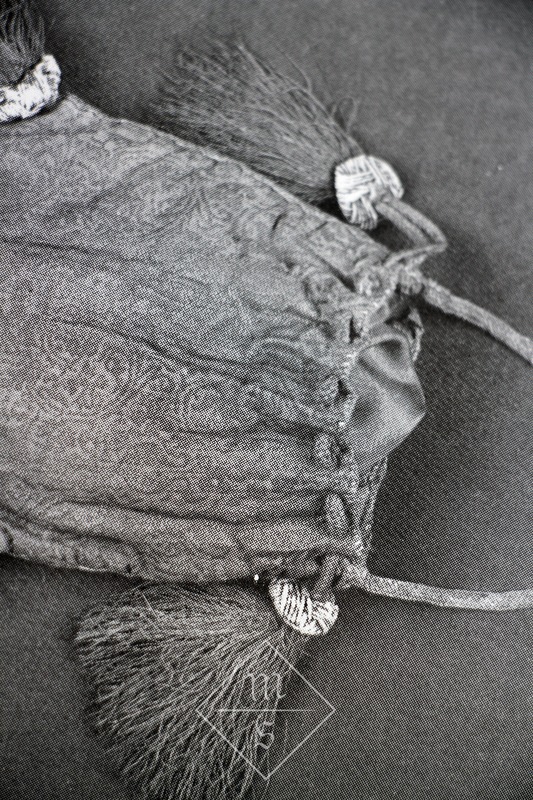 Most extant medieval purses have at least two or three tassels, so this short-cut is really great. 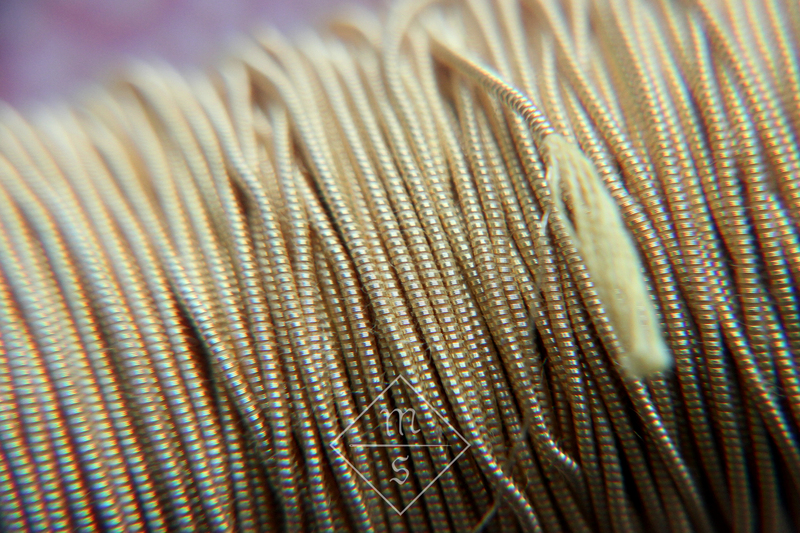 Start with a good quality silk for making tassels (I prefer Devere 36 thread). Pictured are two spools of 50 metres with which we'll be making 5 tassels of about 6,5cm long. I don't want to wind every tassel seperately trying to remember how many times I wrapped the thread around to make sure my tassels will be evenly sized. So, I'm wrapping my five tassels in one go. To do this, we first need to know the length we need. So, for a tassel of about 6,5cms long, the total wrap circumference has to be 13cms. If we want five tassels, we need 13*5=65cms. 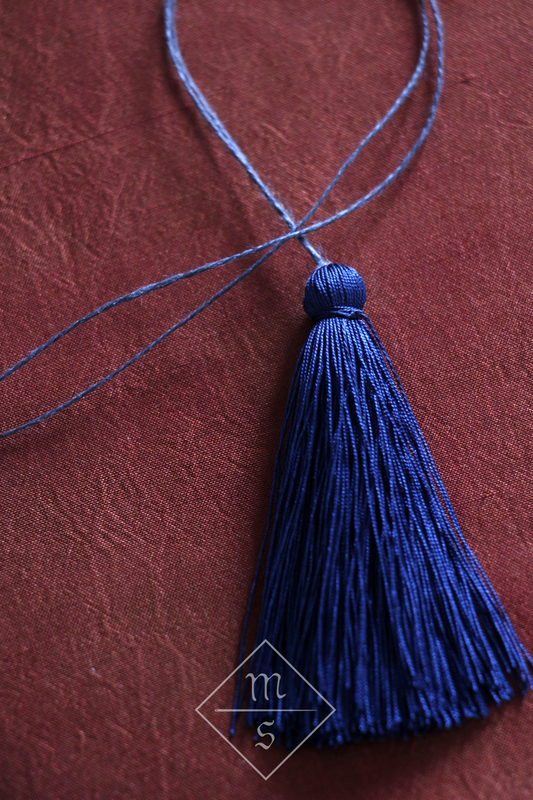 Add a few cms extra, so that afterwards you can trim the tassels nice and even. Normally you would wrap the thread around two fixed points, for instance glue clamps fixed to your table, but I found that my 'Woven into the earth' had exactly the circumference I needed. When done wrapping, tightly tie a string around the wrapped threads at intervals of 13ish cms. Take the tassels-to be from the clamps or remove your book and cut through the wrapped threads right in the middle between each pair of knots. Another method, which is preferable if you do not want the knot to show, is this. However, since most medieval tassels heads are covered by turk's head knots or other decorations, I don't bother with the second method. That's it! 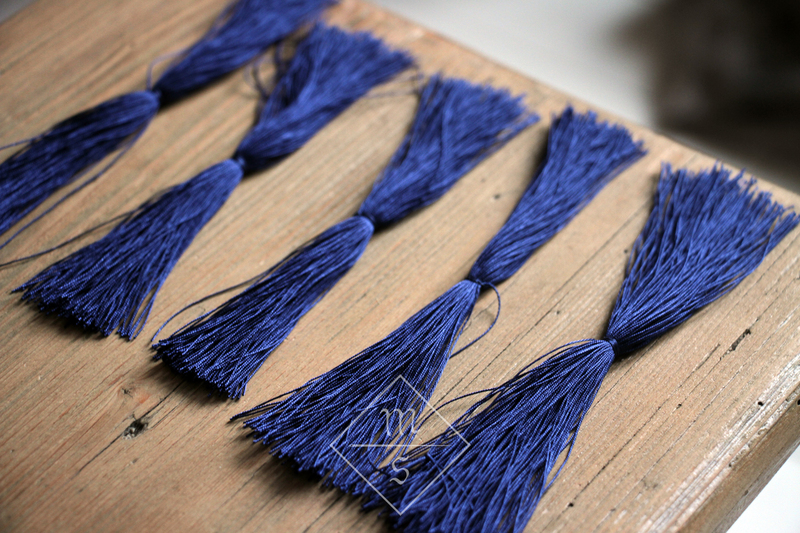 Making all your tassels in one go saves so much time and so much headache! 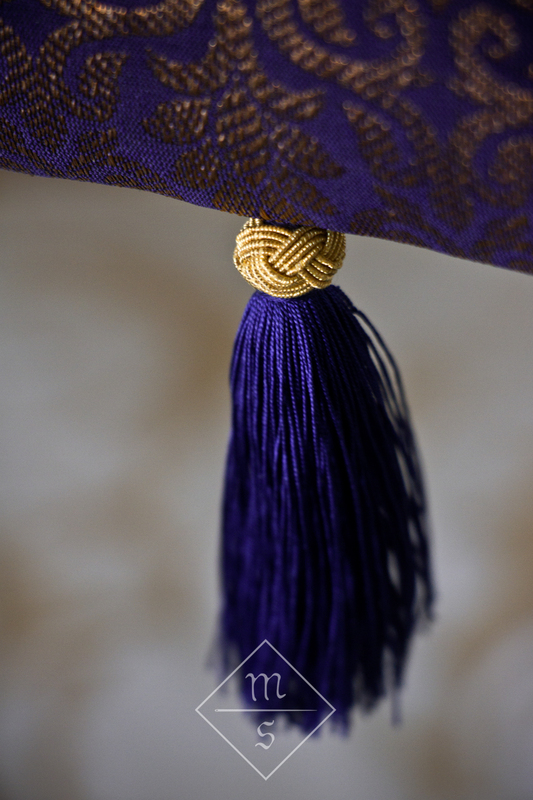 Once you master making this simple tassel you are ready for some of the more advanced tassels I hope to post soon.